Chart of the week: China's parallel online universe When people in the Americas, in Europe or many other parts of the world go online, they mostly use the same services and platforms. U.S. companies such as Google, Facebook and Amazon are so dominant in their respective fields, that most people consider them global market leaders. There is one major market however, where the internet looks entirely different and hardly anyone uses the services that are ubiquitous in the Western world, and that is China. Favoured in part by the Chinese governments’ censorship practices and in part by cultural differences, a parallel online universe exists behind what is often playfully referred to as the “Great Firewall”. 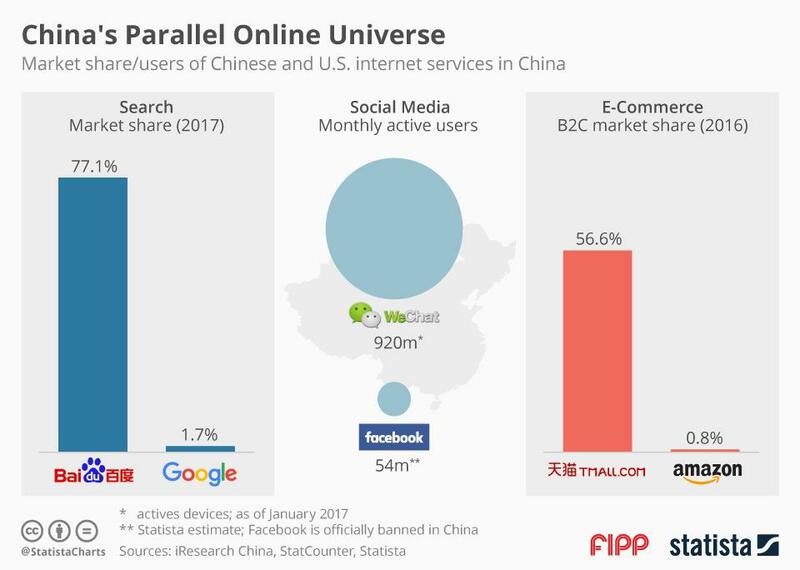 The following chart from Statista illustrates of how domestic players are miles ahead of their US competitors in the Chinese markets for web search, social media and ecommerce.